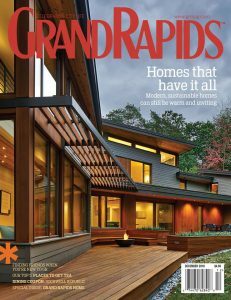 Thanks to the Grand Rapids Magazine for featuring both our Deer Haven House and our Romence house in their December 2018 issue. We were excited to see our Deer Haven House on the cover. The issue is available at newsstands around Grand Rapids now! “At first glance, passersby might not assume that two homes — one on a large, secluded plot in the woods of Cascade, the other on a small lot in residential Grand Rapids — have much in common beyond a modern façade. They would be surprised to discover, however, that the homes, while unique in their own ways, share striking similarities once you step through their thresholds.” Read more of an excerpt of the article found online HERE.